Marble Quarry RV Park is located ¼ mile East of Columbia State Historic Park in Northern California’s scenic Gold Country. 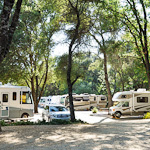 We offer 68 RV sites with full hook-ups, 10 tent sites with water and electric, and 5 cabins in a beautiful park setting that includes a sports lawn, swimming pool, playground, convenience store, and gift shop. California’s Gold Country spans roughly 150 miles from Nevada City to Oakhurst in the Sierra Neveda foothills and is a popular destination among travelers seeking recreation and memorable vacations. There are numerous attractions to visit within walking and driving distance from our campground including the historic gold rush town of Columbia, Railtown 1897 where you can ride a train pulled by an historic steam locomotive, Moaning and Mercer Caverns, Calaveras Big Trees (giant sequoias), and the world-famous Yosemite National Park. The Gold Country also offers an abundance of activities that will satisfy everyone’s interest including hiking, fishing, golfing, water sports, gold panning, zip lines, wine tasting, farmers markets, shopping, museums, casinos, and more! There are three live theaters in the area that offer top-notch entertainment and numerous restaurants to give you a break from cooking. With our central location to some of the best attractions in the Gold Country combined with our beautiful campground and friendly staff, Marble Quarry is the perfect year-round choice for your next vacation or weekend get-away. Call today to make your reservation!